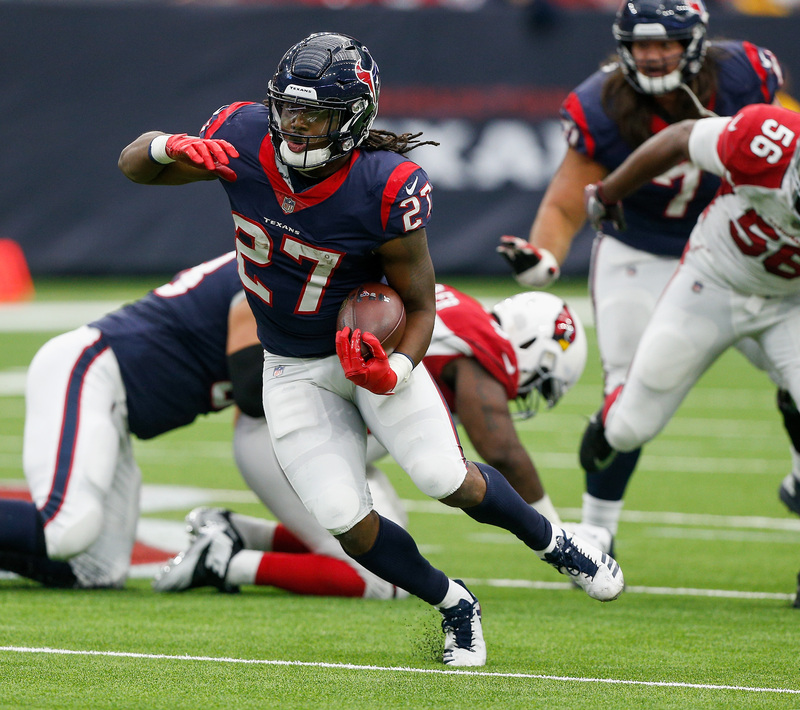 Houston Texans running back D’Onta Foreman is just part of the reason his team’s future is so bright. He took a few minutes to discuss his rookie season. Even though the Houston Texans had a rough 2017 NFL season, nobody questions the bright future with this football team. Injuries wreaked havoc on the two-time defending AFC South champions, as the Texans went 4-12. One bright spot that we wish we saw more out of this team was rookie running back D’Onta Foreman. Foreman was the 2016 Doak Walker Award winner and a consensus All-American in his junior year with the Texas Longhorns. The Texans drafted Foreman No. 89 overall in the third round of the 2017 NFL Draft. As a rookie, Foreman rushed 327 yards on 78 carries and two touchdowns in 10 games. However, his rookie season was cut short during the best game of his young NFL career against the Arizona Cardinals on Nov. 19. While he rushed for 65 yards on 10 carries for two touchdowns, he tore his Achilles’ tendon on that trip in the end zone. Houston still won that game over Arizona, 31-21. Obviously, Foreman went through a lot in his rookie campaign with the Texans and has plenty of experiences to share about his first year in the league. Foreman will be at the NFLPA Collegiate Bowl in Los Angeles on behalf of Panini America signing his rookie trading cards. He will also speaking with the players in the Collegiate Bowl about transitioning to the NFL life as rookies. Foreman took a few minutes to discuss with us thoughts on his rookie season out of Texas with the Texans, how his recovery is going and all good things about the sport that we love that is football. FanSided: D’Onta, what can you tell me about the work you are doing with Panini America at the NFLPA Collegiate Bowl in Los Angeles? D’Onta Foreman: So we’re up here just basically signing cards, signing our Panini cards and trying to finish those up to get those in fans’ hands. You know, so they can enjoy them, collect them and you know, do whatever they do with them. FS: Last season was your rookie year in the NFL out of Texas. What do you plan on telling the players during this year’s Collegiate Bowl about your experiences with the 2017 Texans? DF: It was definitely bumpy, a bumpy ride being a rookie. To get injured, like tearing an Achilles’ and to see a lot of guys on my team suffer from injuries. So that’s not winning the game we wanted to win. I really think what I would tell guys is that not everything is going to be perfect, not everything is going to go your way. But it’s the mental toughness that you have to have, to strive to be better each and every day. Even when things aren’t going your way, just keep positive energy around you and try to do everything to help the team succeed. FS: You’re part of a very impressive rookie class with Houston along with guys like quarterback Deshaun Watson and linebacker Zach Cunningham. What was it like coming into the league with those guys? How do you see last year’s rookie class helping Houston get back on track in 2018? DF: Just the hard work we did every day. Deshaun and I are taking are rehab very serious. I’m in the training room with him every day. I see the work he’s putting in, the work I’m putting in. And you know, Zach played the whole season and he was able to make some good plays as well. So I’m very excited about the young talent that we have and what we can bring to the table. I feel like we gave what we gave to the fans, but we weren’t able to take them with what we are able to do. I feel like we haven’t even reach our ceiling. There’s definitely more room to grow, more to learn. Just trying to be better to help us win more games. FS: So you and Deshaun’s recovery has been going over very well? You guys have been working at the Houston facility. Should you guys be good to go for the preseason? DF: Yeah, I believe we should be ready for training camp. Going forward with that, that’s the timetable we’re playing with right now. While I’m not exactly sure what Deshaun’s timetable is at, for me, I’m shooting for training camp. That’s what I’m looking forward to. FS: I’m looking forward to seeing you guys back out on the field for sure. What do you think it will take for Houston to get back on top in a very competitive AFC South? DF: I mean, I feel like we have all the right guys in the locker room. We just have to first, take care of our bodies and get as healthy as possible. I think that’s one of the biggest things. And also, just put more time in. I definitely believe that guys put the time in before, but we didn’t have the season we wanted to have. So we can always be better, you can always do more. I think doing more, putting in more time, studying more film. I feel like we have to. Like you said, it has become a strong AFC South. We just have to find a way to be the best team. FS: Though it wasn’t the year you guys wanted, wide receiver DeAndre Hopkins had an incredible 2017. What can you take away from your teammate’s successful season that will make you a better player in year two? DF: Not really. And I say that as humble as I can. To me, DeAndre is the best in the game, honestly. You know, some of the other guys we have on the team and the work they put in. I’ve watched those guys for a whole year. I’ve been able to see how they work at practice and how they work off the field. Those things we talk about in the locker room, to better help ourselves on the field. I feel like it just couldn’t show for me and Deshaun. But I think once we get that first full season under our belts, I think just being in it is the biggest lesson. Being in there and doing it. That’s the biggest lesson more than anything. Just being in there getting those games we missed, catching up on those, I think that’ll be it. FS: What would you say is the biggest adjustment you will have to make heading into your second year in the league? DF: The biggest adjustment will be first, taking care of my body more. Just understanding that anything can happen at any moment. You just have to be prepared and do all the right things for your body. Other than that, I don’t know. I feel like when I was in those games, I played my heart out, I gave it my all. I was disappointed in the two fumbles that I had during the season. So those are things that I will want to correct. But other than that, just really my body. That’s the biggest thing. FS: Finally, I have to ask a question about your alma mater. I’m a big college football fan. You were very impressive at Texas. How do you think the Texas Longhorns will fare in year two under head coach Tom Herman? DF: I think they’ll be great. Coach Herman took those guys to a bowl game. That was great for the team and for the university. I’m proud of those guys for going out there and really working hard. Being able to win a bowl game after not being to a bowl game in the last two years. So I’m excited to see how they are. But it looks like they’ve got some young talent that I’m seeing. I think they’ll be good.